Brace yourself for an immersive landscapes with striking mountains and cascading waterfalls blending with stunning limestone grottoes. Explore hidden hill tribe villages and take in the tranquility of this spectacular place. Explore Vietnam’s cultural diversity: Visit the interesting Thai Nguyen Ethnic Museum and take a delightful stroll to hill tribe villages. Witness stunning landscapes: Spend two days in Vietnam’s cragged area, visiting caves and waterfalls while enjoying miles of untouched mountain landscapes. Visit Ho Chi Minh’s hidden base of operation: Travel near to the border area to see where Ho Chi Minh hid while masterminding for the country’s own independence. This morning, tour guide and driver of Ultimate Odyssey Travel will come to your hotel in Hanoi to pick you up. Embark from Hanoi for a scenic drive to Thai Nguyen City. Along the way, take a short stop at the Museum of Cultures of Vietnam's Ethnic Groups (closed on Mondays and from 11h30 to 13h30). The museum was originally established to exhibit and share the culture and history of various ethnic groups in the northern area during the Indochina War. Nowadays the museum gathers some fascinating exhibitions representing the richly culture of major hill tribes settled in Vietnam. After a museum visit, enjoy a delicious lunch in a local restaurant. In the afternoon continue towards Cao Bang city in the mountainous Cao Bang province where is home to various ethnic minority communities including the Tay, Nung, Dzao and Hmong. Have dinner with locals at their house. Estimation distance & transfer time: 280 km; around 7 hours. Start your morning with a tasty breakfast in the busy market in Cao Bang. You can sample some famous local dishes such as ‘Pho Bo’ or ‘Banh Cuon’ before heading north towards the border. Take a short break in a picturesque hamlet of a Nung ethnic group specializing in making homemade incense sticks. Strolling around the village to experience their daily life and interact with the locals. Head out to the appealing blacksmith village of Pac Rang, famous for its knives in molded iron made by a Nung community. Upon arrival to the Sino-Vietnamese border, discover the stunning Ban Gioc waterfall, also known as one of the biggest waterfalls of Vietnam. Enjoy a tasty lunch in a local restaurant. In the afternoon, continue to Nguom Ngao cave, one of the most spectacular and stunning limestone grottos of the Northern provinces. 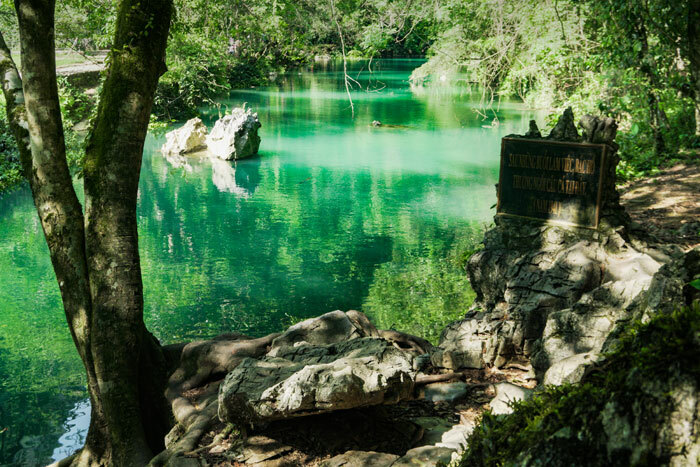 Upon entering the grotto, walk around 1 km to witness the spectacular natural formations. In the late afternoon return to Cao Bang town. Have Dinner and Overnight in Cao Bang. 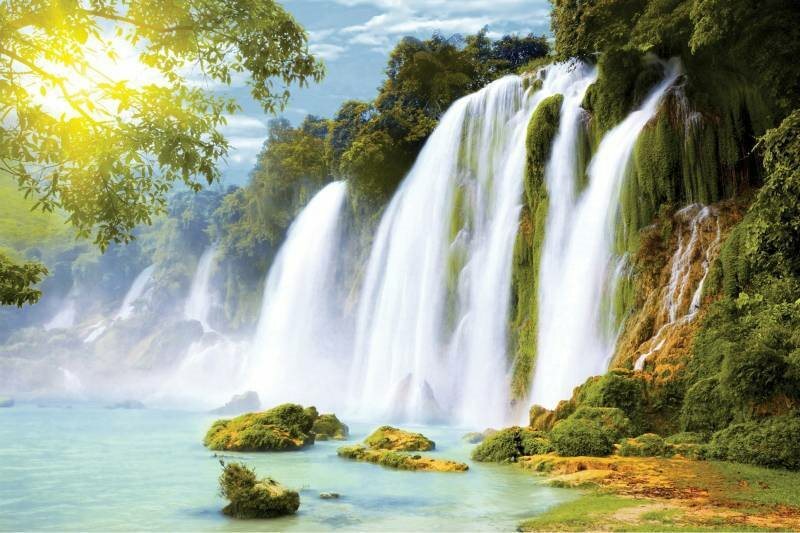 Note: Authorization and passport are required to visit the beautiful Ban Gioc waterfalls. During the dry season, the water level can be minimum. Estimation distance & transfer time: Approx 180 km; around 4-5 hours driving time. Head out early northwards the border to visit the former base of operation of the great president Ho Chi Minh. Observe the timeline in 4 years of how he mastermind the 1954 independence from French colonialists. Then visit the giant water wheels which make a fantastic look against the surrounding mountains. We also will have a chance to see Pac Bo Cave. Notes: During some months (June – September) the itinerary might be changed based on the day, weather & road condition. Estimation distance & transfer time: 370 km; around 8-9 hours.